Rare earth production from ion-adsorption deposits constitutes an important rare earth production route, and the most important production route for heavy rare earths such as dysprosium and terbium. The demand for dysprosium has experienced substantial growth in recent years, mainly due to its use in neodymium–iron–boron (Nd–Fe–B) magnets, the demand for which is increasing largely due to their use in efficient motor applications. Hence, the analysis of environmental impacts associated with rare earth mining and processing is gaining importance. 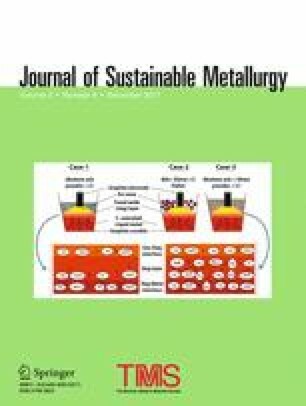 In this study, a life cycle inventory for rare earth production from ion-adsorption deposits was compiled through a detailed analysis of the literature and with help from industry experts. A detailed review of the literature on environmental impacts associated with the mining process was also conducted, and impacts not covered by the current impact assessment methods are discussed. Despite the detailed study, data uncertainties remain. Therefore, recommendations for further research are given, including further investigations into the fate of emissions from in situ leaching of rare earths in the proximity of the mining site, and development of the methods used to assess resource extraction. The contributing editor for this article was Markus Reuter. The online version of this article (doi: 10.1007/s40831-017-0139-z) contains supplementary material, which is available to authorized users. The research leading to results of this study has received funding from the European Community’s Seventh Framework Programme (FP7/2007–2013) under Grant Agreement No. 607411 (MC-ITN EREAN: European Rare Earth Magnet Recycling Network). This publication reflects only the authors’ views, exempting the Community from any liability. Project website: http://www.erean.eu. The authors would like to thank Solvay for enabling the expert interviews and for their help with the compilation of this dataset; Winfried Bulach, Bo Weidema, Lauran van Oers, Mikhail Tyumentsev, and members of the EREAN Steering Group, and two anonymous reviewers for valuable comments.